When journalist and author SHOBA NARAYAN and her family left New York after living there for years, little did she know that her new life in Bangalore would involve a close friendship with a milk lady. It’s the subject of her latest book. While that story begins with a cow in the elevator of a high-rise building, this excerpt is about her journey back to India. We used to live on 66th Street and Central Park West, in the shadow of Lincoln Center. In many ways, it was an idyllic life. We walked across Sheep Meadow—had sheep ever grazed on that particular meadow?—to pet the animals in the Central Park Zoo. We woke up before dawn to move our car across the street depending on the day’s alternate-side parking rules. We bought Priscilla’s Pretzels from a cart down the street before ducking into the Museum of Natural History to see dinosaurs on winter afternoons. I knew exactly which subway car to get into so that I could escape through the turnstile at the 116th Street station before anyone else in order to sprint up the steps to Columbia University’s Journalism School when I was late for class. I knew the cashiers at Fairway, and could catch the eye of the baker behind the counter at Zabar’s—a decided privilege, particularly on weekends when the suburban hordes descended. He would nod slightly and throw me a box of chocolate rugelach. We used nebulous words—culture, identity, and homeland—to explain the impending move to our friends, our two young daughters, and mostly to ourselves. Both Ram and I grew up in India. Though we became naturalized American citizens, we ate vegetarian Indian food at home and went to the Hindu temple in Queens. We spoke to our daughters in English and to our parents in Tamil. We have American passports but listen to Carnatic and Hindustani music. I watch House of Cards, Homeland, and The Good Wife rather than Indian soap operas; indeed I cannot relate to their high-octane histrionics, which make Jane the Virgin seem tame in comparison. Exile, wrote Palestinian-born cultural critic and scholar Edward Said, is the “unhealable rift forced between a human being and his native place; between the self and its true home. It’s an essential sadness that can never be surmounted.” For immigrants like Ram and me, this is a double whammy. Born in India, we came of age in America. We could relate to both cultures, yet belonged to neither. We were like the primordial Trishanku of Indian mythology, who hung between heaven and earth, unable to choose his home. We straddled India and America, sandwiched between our Indian parents and American-born daughters. Heritage is a hazy concept but that’s what we used to explain our move to the children. We wanted them to know their heritage, we said, while hoping that they wouldn’t ask if we knew it. The more tangible reason was our parents—both sets were still in India. They were getting old. Their annual trips to the States to spend time with us wore them out. We wanted our kids to know their grandparents, their cousins and relatives. After much heartache and discussion, we pulled the plug on our life in New York and moved to Bangalore. Across the street from our new building is a large army settlement, reflecting Bangalore’s colonial roots. The British army was stationed in Bangalore, thanks to its temperate climate. We live in what’s called the cantonment neighborhood, with the barracks now used by the Indian military and their families. Winston Churchill served here in his youth and still owes thirteen rupees to the Bangalore Club—a private club with a waiting list of thirty-two years for membership. Prince Charles offered to settle the account when he visited Bangalore in the late ’80s, but the club, which proudly displays young Churchill’s outstanding dues in a glass-enclosed ledger, refused. The self-sufficient army enclave has schools, churches, clinics, homes, training grounds for its staff, and, as I come to find out, a milk woman to service their dairy needs. From our terrace, we look out at meticulously maintained roads bordered by flowering trees, clean sidewalks, and no garbage, all unusual for a large Indian city. It is from this vantage point that I first see Sarala the milk lady. 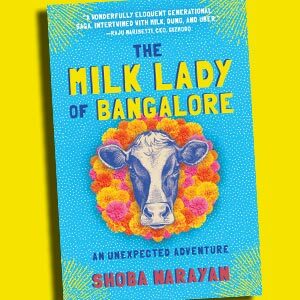 Excerpted from The Milk Lady of Bangalore: An Unexpected Adventure by Shoba Narayan © 2018. Reprinted by permission of Algonquin Books of Chapel Hill. All rights reserved. Shoba Narayan (shobanarayan.com) writes about food, travel, and culture for Condé Nast Traveler, Financial Times, New York Times, Wall Street Journal, and Saveur. Her commentaries have aired on NPR’s All Things Considered. Narayan is also the author of Monsoon Diary: A Memoir with Recipes, which was a finalist for a James Beard Award, and her essay “The God of Small Feasts” won the James Beard Foundation’s MFK Fisher Distinguished Writing Award. The Milk Lady of Bangalore is filled with legends and myths about cows. Were most of these stories you learned growing up in India, or did you do a lot of research for the book? A bit of both. I listened to a lot of stories from Hindu mythology while growing up in India, and they form part of my subconscious. What surprised me while researching the book was how central the cow was to Hindu mythology and faith—I wasn’t aware of that while growing up. As for now, well, you know how it is: once you start researching something, you see it everywhere. These days cows infuse my dreams and the stories that I tell my children. What made you decide to chronicle your friendship with Sarala, the milk lady? How did Sarala and her family feel about your writing about them? Knowing Sarala and her family has been a great privilege. She has taught me so much about living in the present, about dealing with adversity. I think any writer would see that Sarala is a wonderful character, too—she’s strong, opinionated, passionate about her family and her cows. I have to admit that though she was happy for me to write about her, she doesn’t read English and she was not all that interested in the result! After all those years living in New York, what American ways did you and your family take with you back to India (besides a preference for pasteurized milk)? I came to America as a tabula rasa. I was a young college student from a sheltered family who hadn’t the space or time to think about things. America taught me independence, feminism, and instilled a spirit of adventure and enterprise. I am who I am because of this country and I love America and its people for that reason. Beyond that, we carried back lots of memories. Fall in New England. My first snowfall. Summer in Memphis, Tennessee. What else? Bagels, pizza, artisanal bread—the list could go on and on.